Influenster invited me to join the #WipeforWater challenger and since I love trying new products, I was definitely game. Read on to see what I thought. This Earth Month, Neutrogena® Naturals is partnering with The Nature Conservancy to save water. Take the #WipeforWater challenge and pledge to clean your face without using water — and only using Neutrogena® Naturals Purifying Makeup Remover Cleansing Wipes — for 3 days! Then, get sharing about your Neutrogena® wipes with your social networks! For each pledge, Neutrogena® Naturals will contribute $1 to The Nature Conservancy to support water conservation, up to $50,000. These ultra-soft wipes effortlessly dissolve all traces of dirt, oil and makeup. It targets even the most stubborn long-wearing and waterproof makeup. Skin is left purified, fresh and healthy-looking with no greasy residue, so there’s no need to rinse. It is formulated with pure, naturally-derived ingredients and without any harsh chemical sulfates, phthalates, parabens, or unnecessary additives. My first impressions were that these wipes felt so soft and smelled so good! They have a faint green apple smell that reminds me of my college days of wearing Bath & Body Works Country Apple. I do wear quite a bit of makeup, but I did find that one wipe actually did a pretty good job removing most of it, but left some mascara behind. I used a second wipe to make sure any remaining makeup was removed. I found that these left a bit of residue behind, which was a little hard for me to leave alone. I guess I'm just used to that squeaky clean feel! I think someone with drier skin than mine might like this feature, but I couldn't resist giving my face a pass with a damp washcloth to get that residue off. I definitely used less water than I normally do when washing my face though. I don't think these will change the way I wash my makeup off, but these will be great for times when washing with water isn't an option. They will be *perfect* for my daughter's theatre bag to help her cleanse off her makeup after a production. She has a role in our local children's theatre production of Dear Edwina Jr. coming up so I have already put my package in her bag. Since she is young, I love that these wipes are free of harsh chemicals. 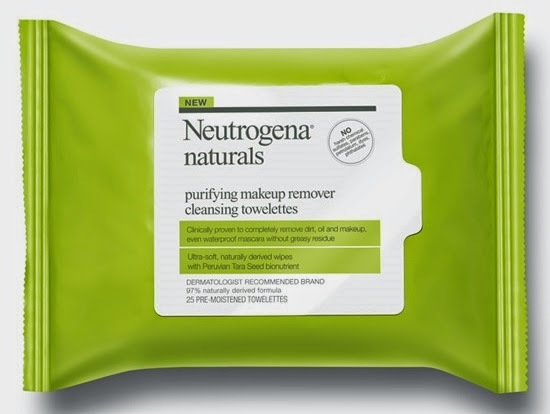 Neutrogena® Naturals Makeup Remover Cleansing Towelettes retail for around $6-7 for 25 wipes. Disclosure: I received this item complimentary from Influenster for testing purposes.